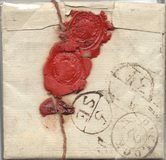 1798 Cover addressed to Pelican Ins. 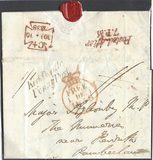 Office, Lombard Street, London, with, on the front, a fair convex BURY and showing on the reverse a very fine London circular datestamp with Code D above, L10. 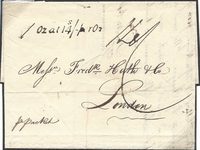 1795 Cover addressed to Edinburgh with on the front a very fine circular dated 'PAID/MR/10/1795', 32 mm, L99. 1697 Entire FROM ASHBY addressed "To Mr John More att Sr John Mores in Mincing Lane London" showing a very fine LONDON BISHOP MARK FOR 'FE/28'. 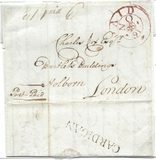 1786 Cover to London showing a VERY FINE 99 LYNN first-type mileage, NK 242. 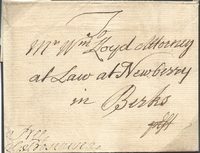 1787 Cover addressed to Brick Court Temple, London, with, on the front a poor 110 NORWICH mileage and on the reverse, a London Experimental datestamp for 'FEBY 13', L 4b. 1780 Entire from London to Margate showing a VERY FINE 'PARTINGTON' RECEIVER in black, L 71. 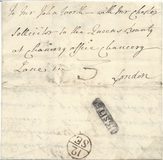 1796 Entire from Grays Inn to Threadneedle Streeet showing a fine HOLB/HILL 2, L 419. 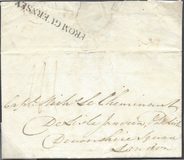 1826 Cover from Hamburg to London showing a very fine London Foreign Office "'2'/OZ AT 6S/8D PER OZ" and Manuscript '6/8', L 1035b.